Growing up in the ’80s, it was all about Big. Big hair. Big boom boxes. Big guitar solos at big concerts. Pyrotechnics! Shout-along choruses! Even throughout the ’90s, I liked big venues: Alpine Valley, Target Center, or, later, the rolling hills of Rock Fest. There was something communal about being in a crowd of thousands, all chanting in unison for the same song at encore time. I kept a mental list of the biggest names in Rock, and hoped to see every single one, multiple times if necessary. I tucked the ticket stubs in the CD cases; they’re still there. Not everything was always a rocktopian dream, though. Tickets got expensive. Long drives late at night became less glorious in bad weather. And lottery systems for tickets too often placed my friends and me in the upper deck at arenas. One time, seeing Robert Plant and Jimmy Page from the back of the Target Center, we passed around a set of binoculars to get a better look at the band. At one point, I used the binoculars to get a better look at the Jumbotron. No one outside the Chippewa Valley knew this band. This made me wonder what other music I was missing out on. Turned out, a lot. Around those times, I didn’t go to see local bar bands for a few reasons. First, I didn’t know any of their songs. Rather than seeing that as a plus – a way to hear new music – it didn’t mesh with my play-the-hits classic rock background. Secondly, without any affiliation to a local band, I felt like an outsider before I even walked in the room. I didn’t dwell on those thoughts; I simply made other music and bar choices, unaware that my musical diet lacked balance. Then one Friday afternoon, a co-worker mentioned that her son was playing trombone in a band at The Metro downtown that night, and she offered to pay the cover charge for anyone from our building who came down to watch. With a connection to the band, a personal invite, and a savings of $3, I was sold. When I walked in, the band, Mount Vernon, immediately impressed me as something special: high school kids, nine of them, playing a ska-jazz-rock fusion with impressive musicianship … and undeniable chemistry. These kids, who weren’t old enough to buy drinks, were impressing crowds of adults with original music, packed with horn solos, dance-driving percussion, and two complimentary lead singers. I went to their regular Metro gigs as often as possible, dragging others along. I wasn’t alone in thinking this band could go somewhere. With the growing crowds who saw them live, it was the general consensus. Yet no one outside the Chippewa Valley knew this band. This made me wonder what other music I was missing out on. As Mount Vernon became DeYarmond Edison, they found a new home at the Stones Throw. So did I – dropping by to see any band that had an interesting flier … there or anywhere else in town. I could go on and on about favorite local music moments, but one sums it up. During a Chattahoochee Soul Food show at Clancy’s, I had to move my beer off the bar to make room for the guitarist who climbed up there for a guitar solo. That’s live music, right there. And, with cover charges ranging from free to five bucks, one could see a year’s worth of local shows for the price of one big concert trip to the Twin Cities. And even in the back of the bar, the view was still better than from 99 percent of the seats in the Target Center. So it was sad when DeYarmond Edison left town and then broke up. But when two new bands emerged from the remains, Megafaun and Bon Iver, they played a show together at The Nucleus. With the crowd at capacity, we squeezed in and sat on the floor, side stage. I was happy to see these musicians attempt to carry on, and also wondered how much longer they could last. 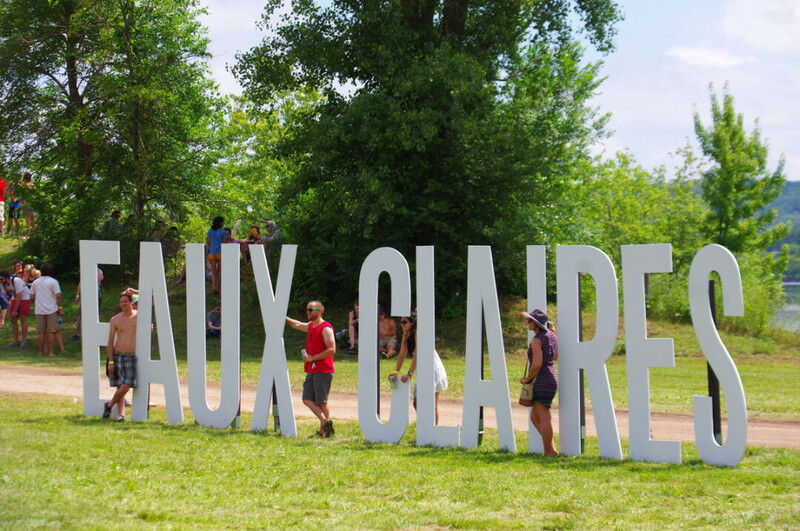 Eight years later, every musician from that coffee shop show performed at some point at the recent Eaux Claires Festival, along with several other bands and musicians who’ve played local bar shows over the years. Put enough of these smaller, independent bands in one place with a few famous headliners, and it turns into an international attraction. Despite the big crowds – over 20,000 strong each day – the organizers made it feel small. With fans spread throughout five stages, and with no VIP seating or territorial lawn chair stakeouts, anyone could roam close to the stage. No binoculars required. In fact, members of The Blind Boys of Alabama were lead into the crowd during their closing number. They were also joined onstage by two vintage members of the Mount Vernon crew, along with the No BS! Brass Band. Those were some bar show moments, right there. Throughout the festival, there was something communal about being in a crowd, whether it was in the hundreds or thousands, applauding in anticipation, happy in not knowing what would happen next.